Flames and smoke rise from Notre Dame cathedral as it burns Monday in Paris. Massive plumes of yellow-brown smoke filled the air above Notre Dame Cathedral and ash fell on tourists and others around the island that marks the center of Paris. 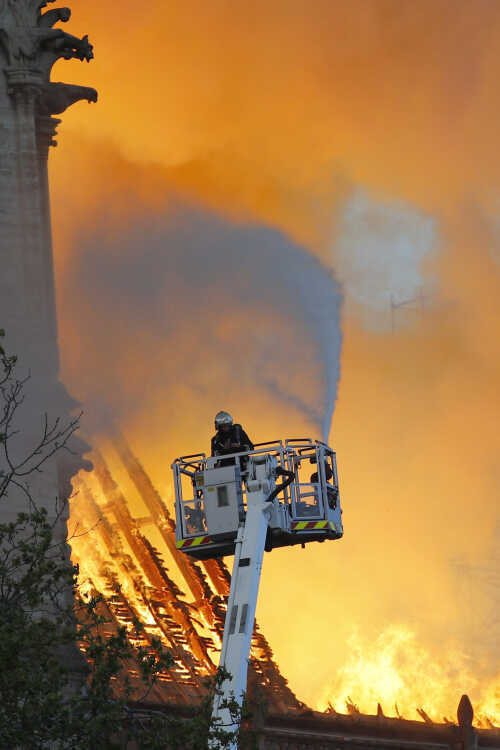 PARIS -- A massive fire engulfed the upper reaches of Paris' soaring Notre Dame Cathedral as it was undergoing renovations Monday, threatening one of the greatest architectural treasures of the Western world as tourists and Parisians looked on aghast from the streets below. 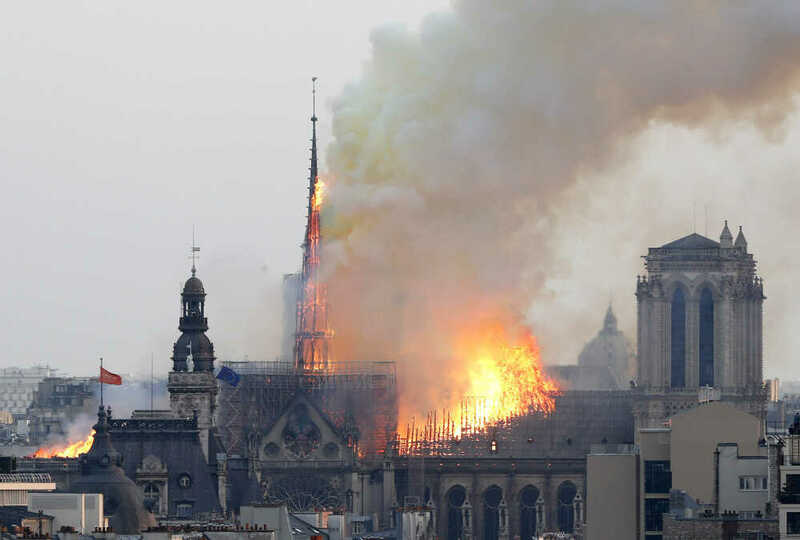 The exact cause of the blaze was not known, but French media quoted the Paris fire brigade as saying the fire is "potentially linked" to a $6.8 million renovation project on the church's spire and its 250 tons of lead. The Paris prosecutors' office ruled out arson and possible terror-related motives, and said it was treating it as an accident. 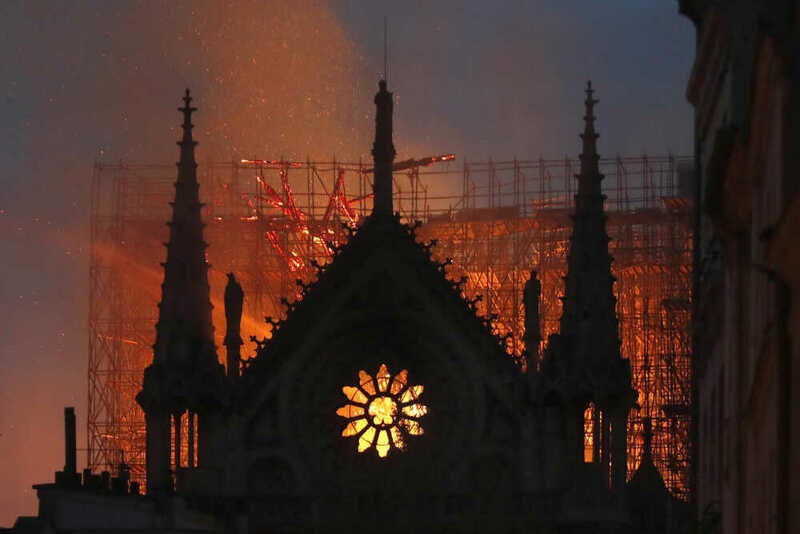 As the spire fell, the sky lit up orange and flames shot out of the roof behind the nave of the cathedral, among the most visited landmarks in the world. Hundreds of people lined up on bridges around the island housing the church, watching in shock as acrid smoke rose in plumes. Speaking alongside junior Interior minister Laurent Nunez late Monday, Gallet noted "two thirds of the roofing has been ravaged." A firefighter uses a hose as Notre Dame cathedral is burning Monday in Paris. Late Monday, signs pointed to the fire nearing an end as lights could be seen through the windows moving around the front of the cathedral, apparently investigators inspecting the scene. The city's mayor, Anne Hidalgo, said most of the significant collection of art work and holy objects inside the church had been recovered. Remarkably, only one of the about 400 firefighters who battled the blaze was injured, officials said. "The worst has been avoided although the battle is not yet totally won," the president said, adding he would launch a national funding campaign today and call on the world's "greatest talents" to help rebuild the monument. Flames rise from Notre Dame Cathedral as it burns Monday in Paris. Among the most celebrated artworks inside are its three stained-glass rose windows, placed high up on the west, north and south faces of the cathedral. Its priceless treasures also include a Catholic relic, the crown of thorns, which is only occasionally displayed, including Fridays during Lent.